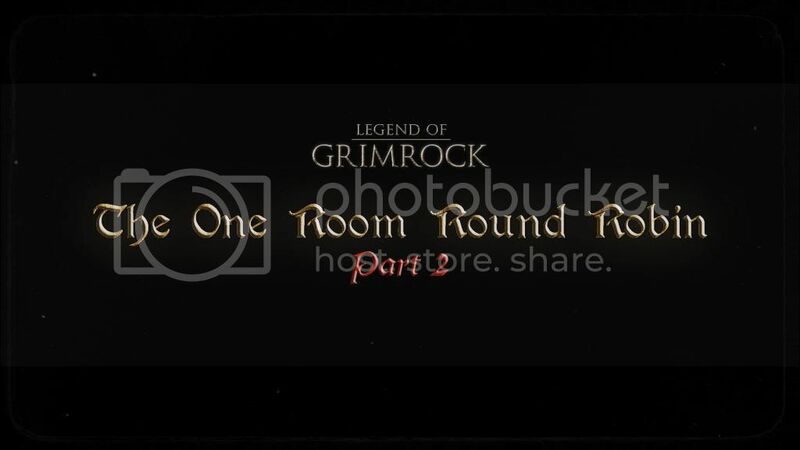 The One Room Round Robin 2 is now released! One year and countless hours of designing, hacking and coding has finally come to an end. Twenty-two creators came together to craft a colossal dungeon that pushes the Legend of Grimrock engine to its limits, utlizing some of the very best of the assets and scripts from the entire Grimrock community as well as dozens of unique material developed specifically for this mod. The premise, my friends is simple: everyone had to participate by designing one room, which was limited to a 9x9 space on three floors. These 22 rooms are the core of the mod, and propose some of the best ideas the community has to offer: to intrigue, to surprise, to impress, to make you smile or laugh. Some rooms hold dark necromancers, some hilarious puzzles. Beyond the rooms, we have built a framing story and connected them all in a global experience, a dungeon with endless interconnecting passages and secrets to discover. Captured and thrown into prison at the bottom of an underground complex in the north, will you manage to solve the rooms, conquer the keys to open the seals between you and your freedom? The completion of each room will reward you with a special key - but you need only a certain amount to reach the top; not all rooms are mandatory to complete the mod. It is thus advisable to save before entering each room, in case one proves too difficult: most rooms may be freely entered and left, but some will lock you in their story until you complete them. Completing more rooms will give you extra keys though, which can be used to unlock many bonus surprises on your way. Be prepared, this is an experience that goes beyond the original game in terms of scope and difficulty. It has been designed and balanced for a 1st level starting party, so importing high-level characters is not advisable. It has been also designed to take Toorum mode into account. Based on our tests, we estimate the total playing time to be between 8 and 15 hours, depending on how much of the dungeon you wish to complete. The dungeon is highly non-linear, and offers many paths to victory. The mod also has an achievements system and a built-in custom information and statistics screen accessible by pressing the I key. What achievements are there? That's yours to discover. Changelog for Patch 1 - "Ice Lizard Sandwich"
General: Fixed bug in Toorum mode which was preventing parts of the dungeon from activating correctly. General: Quickbar and Notebooks scripts have been updated and now you can type in the notebook without triggering quickbar shortcuts or the "I" info screen. General: Some aesthetic fixes (missing pillars and such). General: You can now come back to The Prison, SpiderFigther's and jKos' rooms after completion, via secret passages. General: Added 2 more notebooks to upper levels for storing notes. General: Buttons marked as "activateOnce" stopped making sounds once activated (fixed). General: Chains now allow to pick up items beyond them. General: Adjusted balance and a few glitches with custom spells. General: Some monsters were note counted for the kill statistics and unaffected by custom spells (fixed). General: Fixed an bug with the equipStopper script, which could cause serialization crashes and disappearing items. General: Some enchanted armor had innacurate uiNames (fixed). General: Bonus for oriental weapons combo was not calculated when using enchanted versions of the weapons (fixed). Starting prison: Fixed typos in notes. Starting prison: Room was not marked as "exited" if choosing cultist path (fixed). Starting prison: Adjusted scripts to take into account incomplete parties made with tools such as the Characterizer mod. Starting prison: Removed buggy torch holders near the entrance. Spiderfighter's room: Fixed typos in books. Spiderfighter's room: You could get cornered by the invincible monster under a rare occasion (fixed). Spiderfighter's room: Changed slightly a receptor model to make a puzzle less confusing. Mahric's room: Fixed possible crash with strange apparatus. Neikun's room: A secret could be counted more than once for the total secrets count in the room (fixed). Neikun's room: Incorrect label for the plates count at the end (fixed). Neikun's room: A torch holder trap wasn't working as intended (fixed). Ryeath Greystalk's room: Swirl key could be inaccessible if you pressed the reset button for the puzzle before picking up the key (fixed). Isaac's room: Removed leftover console debug output. Isaac's room: Fixed one or two issues with a custom sword item scripts. Xanathar's room: Fixed bug which prevented the color buttons puzzle to reset if an error was made. 6th floor: Replaced missing item in a secret alcove. 5th floor: Chains on the east of the hub didn't allow flying monsters to pass (fixed). 4th floor: Fixed engine bug due to party:setPosition in spinners corridor. 1st floor: A dagger was lying on the floor (forgotten from testing, fixed). Elemental Shrine: You could receive an extra (useless) diamond key (fixed). Arena: Added a new higher-level achievement. Endgame: Adjusted boss fight monster spawns for balance. Endgame: Fixed a red teleporter which was emitting blue light. Endgame: A note was referring to doors of stone instead of magic doors (fixed). Endgame: You could fall in a pit and get stuck "inside" a secret on the 3rd floor (fixed). Endgame: You could exit the zone when falling in the pits and reach inactive areas (fixed). Endgame: Added a small treasure store room to use a potential extra key. Changelog for Patch 2 - "Blueberry Pie"
General: Some chains on level 5 & 9 weren't blocking the party as they should (bug introduced in patch 1, fixed). General: Some rocks weren't counted correctly for the rocks found counter. Starting Prison: Fixed issues with how the soul dagger was detected, which could prevent it from disintegrating. John Wordsworth's room: Fixed typos in notes and dialogue. Billick's room: Fixed bug with detection of how the ogre was charging. Drakkan's room: Made a trap clearer. Neikun's room: Fixed typo in room name. Diarmuid's room: Fixed possible bug with some puzzle elements not being spawned where they should if frame rate was low. Isaac's room: The autosmith puzzle started half-solved (bug introduced in patch 1 while testing, fixed). Isaac's room: Frostbolt enchantements caused the game to crash (fixed). Isaac's room: You could click a ladder behind a closed secret wall (fixed). Isaac's room: Fixed possible duplicated entity crash. Isaac's room: A torch couldn't be seen from other levels as intended (fixed). Isaac's room: Fixed bug which caused some room elements to be displaced when you reload the game. Isaac's room: Adjusted an error in an item name. Xanathar's room: Fixed possible crash with lens switching. Arena: Adjusted the monsters list. Vault: Adjusted two riddles for clarity. Changelog for patch 3 - "Ogre Burger"
General: Added the orrrManager.setHubRenderingMode(quality) option, callable from the console, where quality is "high" or "low", to see more torches in the hub area. General: Chains on the north side of the hub didn't let flying monsters pass on level 7 (fixed). General: Fixed glitches with stairs corners appearing through walls. General: Added some missing pillars on the east side of hub on floor 7. Starting Prison: The soul dagger wasn't disintegrating properly if thrown or put on the ground (fixed). Starting Prison: Choosing the cultist path could still pose problems with incomplete parties (fixed). Mahric's room: Marbles puzzle alcoves now all accept all colours, to prevent easy solving of the puzzle through trial and error. Mahric's room: Button doesn't "burst with power" any more after the puzzle has been solved. Drakkan's room: Fixed some typos in items names and descriptions. Drakkan's room: Fixed some small errors in dialogue/gui interactions. Billick's room: Fixed wrong behaviour with ogre charges. jKos room: Fixed possible serialization crash. Isaac's room: Drinking the flask of ectoplasm didn't work as intended (fixed). Isaac's room: Fixed small clipping issues with some custom items on the floor. Boyflea's room: Key could appear partially concealed below the statue (fixed). Xanathar's room: You could trick the entrance alcove to leave with a key item (fixed). Arena: Adjusted monsters difficulty curve. Arena: Adjusted items spawning curve. Arena: Items left behind by monsters disappear after 5 rounds. Arena: Fixed a bug where monsters could walk into each other. Arena: Fixed a bug where you could step into a monster's square right after teleportation. Arena: Removed zombie ogre (introduced in patch 2), which should stay unique to John Wordsworth's room. Changelog for Patch 3b - "Ogre Burger"
Starting Prison: Fixed a possible crash when choosing cultist path. The complete sources for the mod are available on the nexus. NOTE: We have tested the mod inside and out many many times, but due to the great complexity of the project and the number of people involved, there might be something that slipped by. If it's the case, we apologize! Please report any issues or bugs here, we'll most certainly be able to provide a quick console fix to allow you to continue playing, and we'll address the problem in a subsequent patch. are made by the room designer. All original Legend of Grimrock assets used or transformed in this mod are a copyright of Almost Human. Drakkan's room images are taken from the Betrayal at Krondor, Black Crypt, Dungeon Keeper, Dungeon Master, Elvira, Eye of the Beholder, Ishar, Lands of Lore, Dungeon Master, Elvira, Eye of the Beholder, Ishar, Lands of Lore, as well as from Peter Jackson's the Lord of the Rings. Boyflea's puzzle plates design is insipred by BBC's "Adventure Game" show. Msyblade's room Kiralynn demon model is made by TheDamnThing at tf3dm.com. for your outstanding support and continuing presence on the forums. we wouldn't be here without your support, this mod is dedicated to all of you. Last edited by Diarmuid on Thu Apr 10, 2014 3:27 pm, edited 10 times in total. Currently working on http://www.darkdale.net, another indie crawler in development! This is your baby Diarmuid, Congratulations (to everyone else too)! This was a project created by both experienced and beginner modders. I cannot overstate the love and work that has been poured into this project. Diarmuid did really turn this for a room-to-room experience into an adventure! I think many of us would loved (been satisfied) too see this mod (inferior) released six months ago. However our project lead did never lose focus or give up, he made us test (and test) and he patiently waited for everyone to finish their room. Modders did magic with scripts, UI, assets, model, puzzles, you name it and all this complexity was tied together by Diarmuid. The mod improved beyond anyones expectations. Everyone should download this mod and play it through, try all the rooms, ask for help if you get stuck (you will be), do not give up! There are some excellent rooms all the way to the top. The dungeon is balanced, hard but fair. Last edited by aaneton on Tue Mar 25, 2014 12:01 pm, edited 3 times in total. This will help waiting for LOG2. I hope AH will give you some feedback about this mod! It's so crazy to think that after all that work, it's ready. I'm so excited! I'm the Gate I'm the Key. just want to thank everybody involved for wonderfull experience and it was really nice to be part of the team and looking to cooperate with you guys again ! It's great to see this massive beast finally unleashed upon the community! Thanks to Diarmuid for taking a simple idea and stretching to its very limits...and having the patience to hold hands, comfort sobbing designers, work through thousands of lines of code, and push himself, the rest of us, and the engine beyond anything we've all experienced thus far. Also thanks to John Wordsworth for his technical breakthroughs! Above all, enjoy it all. "One Room" Round Robin - Round Two! many thanks for the release and your awesome job!